...featuring some 58 retablos, votive works created in this century by Mexican immigrants or their relatives, collected and researched by Dr. Douglas Massey and Dr. Jorge Durand, the exhibition co-curators . 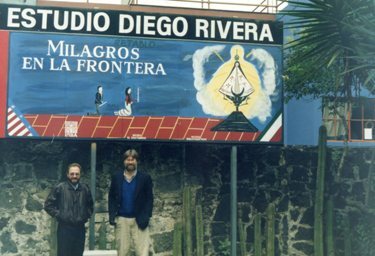 Douglas Massey (professor of sociology at Princeton University), and Jorge Durand (professor of social anthropology at the University of Guadalajara), have collaborated for over a decade in the study of Mexican migration to the United States. Together they have written several books, including Miracles on the Border. Retablo Paintings of Mexican Migrants to the United States, and have lectured widely on Mexican retablo painting.